Kessler Foundation is a global leader in rehabilitation research and employment funding. Our mission is to change the lives of people with disabilities. With the support of our donors, we return people to their homes, their communities, and the workplace. After being diagnosed with MS, Rosemarie had to stop working and adjust to challenges including fatigue, weakness, and difficulties with thinking and remembering. She has participated in over 20 research studies and uses techniques learned to enjoy an active life. Rosemarie says, "I encourage people with MS to achieve their goals. The research at Kessler Foundation helps them do just that." Together, we can help more people with disabilities return to their homes, their communities, and the workplace. 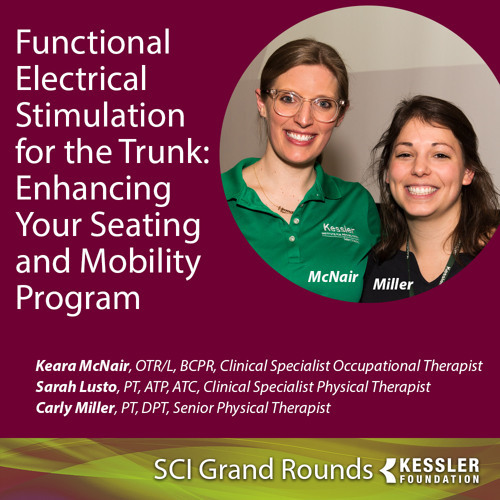 Welcome to a Kessler Foundation Spinal Cord Injury Grand Rounds podcast featuring guest speakers Sarah Lusto, PT, ATP, ATC, Clinical Specialist Physical Therapist, Keara McNair, OTR/L, BCPR, Clinical Specialist Occupational Therapist, Carly Miller, PT, DPT, Senior Physical Therapist all from Kessler Institute For Rehabilitation, West Orange, New Jersey presents “Functional Electrical Stimulation for the Trunk: Enhancing Your Seating and Mobility Program”. Keep up-to-date with the latest information from the Kessler Foundation.